1. Place flour on a plate. Season with salt and pepper. Place yoghurt in a shallow bowl. Combine breadcrumbs, parmesan and parsley on a plate. 2. Coat 1 piece of chicken in flour, shaking off excess. Dip in yoghurt. Coat in breadcrumb mixture. Place on a large plate. Repeat with remaining chicken, flour, yoghurt and breadcrumb mixture. 3. Heat 2 tablespoons oil in a large frying pan over medium-high heat. Cook chicken for 4 to 5 minutes each side or until golden and cooked through. Transfer to a plate lined with paper towel. 4. Meanwhile, heat remaining oil in a large frying pan over medium-high heat. Cook zucchini for 2 to 3 minutes or until just softened. Remove from heat. Add beans, olives, mint and rocket. Season with salt and pepper. Toss gently to combine. 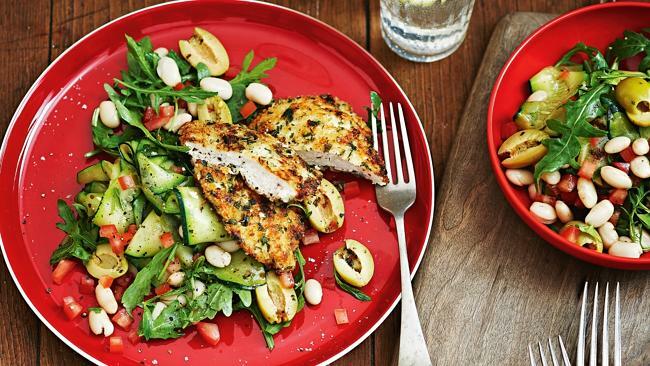 Serve chicken with zucchini mixture and sprinkle with tomato. This entry was posted in Chalkidiki Olives, Inolivia pitted, Inolivia with herbs and tagged Chalkidiki Green Olives, Chalkidiki Olives, INOLIVIA pitted, Inolivia Rich Olive Flavours, Inolivia with herbs. Bookmark the permalink.